I have never been as turned on by an action book of any kind, as I was with “Torpedo” by Jeff Edwards. This is a real page burner that will grab you by the throat as you go from one situation to another with the naval crews portrayed in the novel. This book takes us into today’s world of terrorists. It leaves you feeling that all of this could possibly actually happen today, or tomorrow, in some part of the world. This is the best naval action novel that I have ever read and is perhaps, the best book of its genre of the last decade! This book screams out for a movie version. Some day we may see this book’s story portrayed on the movie screens of the world. It is that kind of action story. This book deals with illegal arms deals, biological attacks on an embassy in Washington D.C. and an enemy within our own NATO family of nations. We are given a look at naval warfare tactics in action by an author who seems to be an expert at educating us, the readers, as we are completely drawn into the story line. It is a must read! OUT GUNNED… OUT MANEUVERED… OUT THOUGHT… THE ONLY WAY TO SURVIVE IS TO CHANGE THE RULES. Their enemy is skilled in deception, and incredibly lethal. Out-gunned, out-maneuvered, and out-thought, the U.S. Navy crews must throw the rulebook out the window, and become every bit as devious and deadly as their enemy. Finally, a book for the children of the military! A true test of any book for children is to leave a copy laying round and see if the little ones pick it up to read or eat. I had a copy of “Daddy, You’re My Hero!” on my table when my little grandchildren saw it. One of them wanted to eat it while the other wanted to look at all the nice images. The book’s cover is kid friendly and invites children to open it up and look inside. However, this book is special for those who are referred to as “military brats” – the dependents of members of the armed forces. This book is written and targeted to them in particular. When Mommy or Daddy goes off to war the children need something to relate to. This book provides something for the toddlers and small ones to help them understand a little of what is going on in their family. The book is wonderfully illustrated and uses colors and images well. The message is simple and clear for the age group. Adults have said that they were emotionally moved reading this children’s picture book. This is a great gift to buy some small child whose parents are activated for duty and are leaving. Author Michelle Ferguson-Cohen has written a great little book that will help preschoolers with the coping process of activation. As a grandparent, I also like the super thick pages so that the book can survive a good chewing or two without being ruined. This book receives MWSA's 5 Teddy Bear rating! Around the world, whether or not we are at war or involved in a military action, soldiers are deployed to service leaving their families behind. Everyday, children of military personnel are being confronted with the difficulties of having a parent deployed in the service of our country. 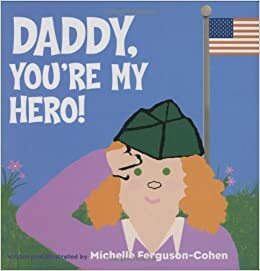 Children's book author and military brat, Michelle Ferguson-Cohen, has written, "Daddy, you're my hero!" and "Mommy, you're my hero!" to help military and reservist's families speak with children about deployment. Little Redhaired Girl Publishing, Inc. hears from many educators, parents, psychologists and military FRGs (Family Readiness Groups) who are using the books as a resource to help speak with their children about the deployment of a parent and war in general. The books address deployment from a child's perspective. They talk about this separation in a simple manner to assure and comfort small children. The books also suggest tips to maintain communication and deal with feelings of helplessness. "I wrote these books from my heart. I know what it's like to experience what these children are facing," says Ferguson-Cohen. "My own father was deployed in the service of our country many times when I was young." It was important to the author that children of military personnel see themselves represented in the media and that the message they received was of both "pride and sensitivity". "You should address a child’s fears," she says "But it’s important the message isn’t so dramatic it worries them further. I also wanted to give children permission to be proud of their parents."